Many architects are out of touch, but so are architecture critics. 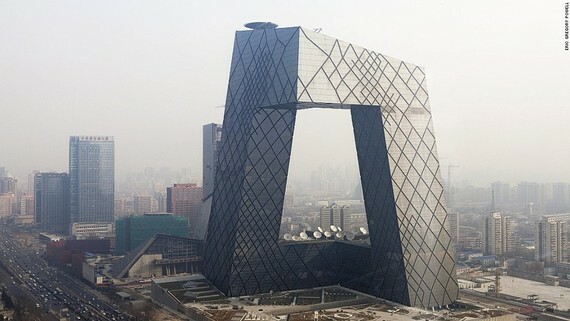 CCTV Tower, Beijing, 2012. Rem Koolhaas / Office for Metropolitan Architecture. Photo by Eric Gregory Powell / CNN. French filmmaker Claude Chabrol once remarked of critics, "Sometimes you are the pigeon, and sometimes you are the statue." This was never truer of architecture critics than it was last month. On December 15, architect Steven Bingler and critic Martin Pedersen, former executive editor of Metropolis magazine, published an op-ed in The New York Times in which they called for design to become more relevant, humane, and sustainable: "While architects design a tiny percentage of all buildings, our powers of self-congratulation have never been greater. Although the term 'starchitect' has become something of an insult, its currency within celebrity culture speaks to our profession's broad but superficial reach. High-profile work has been swallowed into the great media maw, albeit as a cultural sideshow--occasionally diverting but not relevant to the everyday lives of most people." The heart of this critique is a familiar complaint: the most celebrated architecture often seems out of touch, even disdainful, of the communities that surround them. In recent years, more and more high-profile buildings have pushed neglect to dangerous new levels: in Vienna, large pieces of Zaha Hadid's new Library and Learning Centre keeping falling off; Frank Gehry's Disney Concert Hall in Los Angeles originally bounced enough sunlight into neighboring buildings to raise the interior temperature; and Rafael Viñoly's "walkie talkie" building in London actually melted cars on the street. Viñoly's response? "I didn't realize it was going to be so hot." "At what point," ask Bingler and Pedersen, "does architecture's potential to improve human life become lost because of its inability to connect with actual humans?" "I do not know what fantasyland these authors live in that they imagine that for 'millieniums' [sic] ('millennia?') architects collaborated on making buildings that 'resonated deeply.' In fact, the few pieces of architecture that we still treasure today, from the Pantheon to Palladio's churches and villas to Chicago's skyscrapers, were as startling, alien to their environment, and initially unpopular as most new monuments today." Aside from the fact that "millenniums" is a perfectly acceptable plural that Betsky misspells, he gives no evidence that the historical examples he cites were unpopular in their times. (It's well documented that Palladio was, in fact, widely admired in his age, having benefited from new printing techniques distributing his drawings across Europe.) More importantly, what all those examples have in common is that they were designed with scale, proportions, and ornamentation intended to appeal to the human body--a fundamental principle of classical architecture. Surely this is partly what Bingler and Pedersen mean by "connecting with actual humans." But much of contemporary architecture fails to do so. Beijing's CCTV Tower, by Pritzker Prize winner Rem Koolhaas, an "alien" object if ever there were one, routinely wins Chinese surveys as the "ugliest building" in that country, yet former New York Times architecture critic Nicolai Ouroussoff hailed it as possibly "the greatest work of architecture built in this century," describing it as "an eloquent architectural statement about China's headlong race into the future." Do communities want architects (especially foreign ones) to create "statements" about them, or would they prefer the built environment to nourish and enrich their lives? Maybe CCTV is one of those "initially unpopular" structures, as Betsky suggests great architecture always is, and the Chinese will wise up eventually (although he scorns the idea of "some sort of widely-held community standard"). But in describing collaborative building as "fantasyland," Betsky reveals a blindness to history. Architects, historians, and critics alike tend to hold up monuments to wealth and power as the sole canon of great buildings, and they ignore inspired vernacular traditions such as Anasazi cliff-dwellings, Pueblo villages, or the Inuit igloo. All of these were co-created by communities over generations, living the land and learning what works with limited resources. Betsky claims that "good architecture ... sometimes stretches the technology of building to the point that it creates problems," but in indigenous structures technical ingenuity is used to solve practical problems, not create them. I rarely agree with Betsky, whose contempt for green building strikes me as arrogant, but what continues to surprise me is his seeming lack of knowledge about important research and developments in his own field. He once wrote that working toward the design of buildings that are net producers, rather than users, of energy, is "a feasible goal"--a decade after this already had been achieved (by Oberlin's Lewis Center). Now he confesses, "I did not know you could design in a way that is 'tied to our own DNA.'" He derides Bingler and Pedersen for referencing design that pleases "our genetic make-up," but he merely exposes his own apparent ignorance about a growing wealth of scientific study into what architecture can learn from neuroscience and environmental psychology. Biophilia, first outlined in detail thirty years ago by Harvard sociobiologist E. O. Wilson, explores the innate human attraction to nature's patterns of space, shape, and textures and has become increasingly popular among savvy designers, such as KieranTimberlake, because of its thoroughly documented benefits for physical and mental health. Studies into neuroscience and evidence-based design both have received the American Institute of Architects' coveted $100,000 Latrobe Fellowship, so these aren't exactly fringe topics. Is Betsky really not familiar with this research, or does he simply reject it, as he does evidence-based design, which he calls "bizarre"? If Betsky dismisses science as a legitimate basis for design and Ouroussoff applauds buildings as critical "statements," they perpetuate the idea that architecture is "art"--that is, fundamentally a medium of expression for the architect. Ironically, while Betsky mocks Bingler and Pedersen for their "hoary trope of 'anti-elitist' architecture criticism," the architect-as-artist is the hoariest of tropes. Yet, it continues to rule the profession. Frank Gehry, the most famous architect of our time, has said that denying the architect's right to self-expression is like denying democracy. Gehry doesn't need a lesson in civics to know that democracy is the will of the majority, not the individual, but he may need a lesson in civility, given his behavior in October. When a French journalist asked him whether his work represented much more than "spectacle," Gehry flipped him the finger and called 98 percent of all architecture "sh*t."
Architect Lance Hosey is Chief Sustainability Officer with the global design leader RTKL. His latest book, The Shape of Green: Aesthetics, Ecology, and Design (2012), has been Amazon's #1 bestseller for sustainable design. Follow him on Twitter: @lancehosey.